We know there was a lotta luck involved with us getting invited to interview Stephenie Meyer, and we felt privileged to take your questions and get answers! Kassie and I (Kallie) want to send a sincere Texan “Thank Y’all!” to Stephenie Meyer, and the phenomenal women she surrounds herself with! We also could not have done this without the other sites involved, TwilightSource.com (Matt & Elysa), TwiFans.com (Kim & Alison), LetterstoTwilight.com (Bekah & Nikki). We are waiting to release all the ‘GOODS’, but definitely have some teasers for you! You can listen to this week’s show to get some juicy bits, as well as read below to get an idea of a few of the questions WE asked! We were able to spend 4 HOURS talking to Stephenie (Yes, I feel comfy with the first-name-basis) and have loads to dish out… just remember we will be serving them in bite-sized portions! First Course… COOLEST MOMENT OF THE DAY! In the final few minutes of our time with Stephenie, she graciously signed some of our books. When I (Kallie) told Stephenie that I would have a completed set of all of her books autographed she told me that I was the FIRST PERSON IN THE WORLD to have them ALL autographed! *Note: Matt (Twilight Source) jumped right behind me so he could be second! LOL! What is the timeline for when Victoria created Riley, Diego and Fred? When the Volturi went to visit Victoria, did Jane see Bree and Diego in the tree watching? What exactly happened to Diego? What quality did Fred has have a human that allowed him to repel others as a vampire? Did Jane have an ulterior motive for killing Bree? The music on our podcast this week is Ordinary Girl by Helen Austin. We were amazed going through the interview with Stephenie Meyer, and wanted to bring you an answer to one of the MOST asked questions… The very first thing Stephenie addressed was Midnight Sun, and now you can hear it all straight from her! Letters to Twilight: No pressure! Meghan: So alright, go for it! Stephenie: Wait! Wait, wait, wait! Do you all have your tape recorders on? Stephenie: I know that’s what everyone cares about. I also know that the right answer would be for me to say “Oh yah, it’s done! And it’ll be out next month!” But that’s not true. It’s also not true that I’ve got a ton of work done on it, and that’s what I’m working on. What’s true is that I’m really burned out on vampires. And, I don’t want to write it badly. So I want to wait until I’m excited about the material again, and I’m excited about Edward, and that it’s something that’s motivating. You know, when a story is keeping me up at night, and I’m waking up at 4 am in the morning and thinking ‘Yes! That is what is what should happen in this moment!’ Then that is when I can write with happiness! So, right now it feels like homework… it really does. And when things feel like homework they go very, very slowly for me. So it’s still not a “It’s not gonna happen!” I want to do it when I can do it right. You know, I have my share of human stubbornness, and I have to tell you, it’s a little bit hard when people are like “This is the only thing you can do, and it’s the only thing we care about!” And, you’re kind of like a three year old, you want to be like “I’m gonna do what I wanna do!” Yah. “You’re not the boss of me!” So my mom has backed off a little bit. Actually, I was at The Fray concert, and I was hanging out with the guys backstage. They’re really cool, and I was talking to Isaac about it. He was like, “I really want you to do that!” And I was like “Oh my gosh! Come on!” You know I can’t get away from it anywhere. And, we talked about stubbornness and reverse psychology. I have this great thing he signed for me, it says “To Stephenie, Don’t work on that stupid book! Nobody wants it anyway!” I have it by my computer. That really is the right direction to go with me, because I’m like “Huh! Maybe I should do it! I’ll show you!” Psychology! Anyway, that’s Midnight Sun! so, that should disappoint everyone! Twilight Series Theories: I don’t think so! Stephenie: Ok! so now we’re done! (Laughing) So, I’ll see you guys later! Letters to Twilight: That’s totally understandable. Twilight Series Theories: I would rather wait. Twilight Source: We’re not reading it until it’s done. Twilight Series Theories: I haven’t read it! Letters to Twilight: You haven’t! Stephenie: The people I worry about are the haters. You know, that like to talk about what a horrible writer I am and all that stuff. When I do write it they’re going to say “Oh, this was worse than the first half because now she did it badly!” No matter what I do it’s going to be that way. There’s a mental block there. You know what people are going to say, so I have wait until it’s just me and the book again. Then I can feel excited about it! You know, sometimes I’ll sit and think about the car chase, that we don’t get to see from Bella’s perspective. I have that one completely mapped out in my head. That one wouldn’t be hard to get down. Stuff like that, it gets exciting. Cars. Ya know! The first car he steals I have picked out, and then the second one. It get’s messy! It’s gonna be great! You have to get excited about things! But, that’s Midnight Sun! 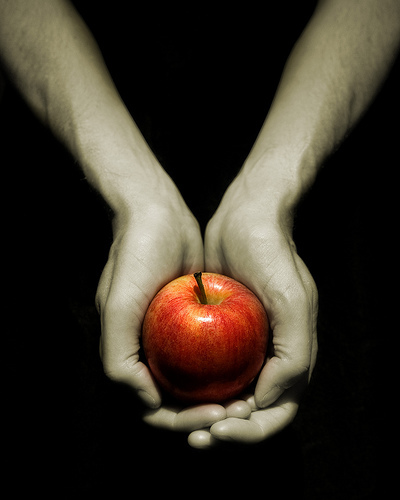 Twifans: What do you think of Twilight fan-fiction? SM: Fan-fiction has become kind of a mixed thing for me. like in the beginning I hadn’t heard of it and there were some that were…I couldn’t read the ones that had the characters IN character. It freaked me out. um, but I liked. there was one about Harry Potter and Twilight that was hilarious. And then there was one that was about a girl who was starring as Bella in the movie and that was funny. And uh, I hear so many people arguing about fan-fiction. This one and that one. It seems like they are not as much fun anymore. I don’t know. SM: It makes me frustrated. I’m like…go write your own story. Put them out there and get them published. That’s what you should be doing. You should be working on your own book right now. SM: (talking more about fanfics) As long as the writers of it, move on from it. I think it’s sad to spend so much energy on something you can’t own. And that makes me a little bit sad because all these talented kids should be, ya know, get your story out from under the bed and get it out there. Twifans: Well if you won’t write it, we have to have something. Twifans: The ones that I love are the ones that are so good, they could be a novel, if they would just change the names, because it’s nothing like the plot. SM: That means it’s their own story and maybe they want to have a venue to try their stories out and that’s something too. Yeah, but you do have to kind of have to worry. The whole Midnight Sun….mess, came about because, when you first get started, you really want people to read your book & give you feedback and no one’s ever gonna care, like you don’t have to worry about leaks. That’s such a crazy idea. With MS you know, I had a readers group and we all read each other’s stuff and that’s very normal. I saw a lot of feedback, like “she shouldn’t be giving her stuff out”, but 10 years ago before anybody knew that had ever read Twilight, did you ever think anyone was gonna care or look for this crap? Absolutely not. As a writer, that’s how you work. You show your stuff, you get feedback from people, and you learn from it and I think that the fan fiction can do that in a nice way. Ya, know? You least you get to hear some people’s thoughts. Also, but there is a lot of negativity online. If your faced isn’t attached, when you’re in person with someone, I think it’s pretty hard to be like, “I hate you” (laughs). I worry about feedback evolution. Like if we all are all mean on the internet is that going to cross over into real life? Are we going to lose that common courtesy because online it’s completely gone? If you have a writer’s group and you are talking about your work, people are at least going to have some courtesy like “well, this part maybe didn’t work for me” not their not going to be like “you’re the biggest loser in the world” which is what they’re gonna get online and that might discourage some writers that are really good. And shouldn’t be that discouraged. SM: Breaking Down was actually a project for a while. There was a while where you get burned out, we came up with an alternate Breaking Dawn called Breaking Down (laughs). It was awesome! Complete spiraling downward & destruction in Bella Swans life & everyone around her. Charlie became a meth addict. SM: It starts out with Bella on the same cliff, right. Except this time she’s taking her life & she’s going back over like everything that has happened to get to this point. It all kinda got started because there was trouble & Alice and Jacob….I forget how it works…..Jacob killed Alice. SM: So Alice is dead and Jacob is horrified because this is Bella’s fault, and he like…backhands Bella and disappears he’s gone. Alice is dead. So Bella is in the hospital on heavy pain meds which is how Charlie got addicted. She ends up marrying Mike. So she’s stuck with Mike and it’s very depressing and then he leaves her for Eric Yorkie. SM: Oh AND….Lauren Mallory wins America’s Next Top Model. And Charlie ends up getting killed by drug dealers, and I think her mom dies of a heart attack. So she ends up being nothing so she’s gonna kill herself then says “this is stupid, I’m not going to kill myself. I’m gonna rebound, I’m gonna forge a new life. She turns around, trips and falls over the edge. There were so many expectations for Breaking Dawn. if this doesn’t happen, I’m going to hate it and then the exact opposite, if the exact opposite doesn’t happen I’m going to hate it. I’m like I’m going to write something that everybody hates (group laughs) and then I wanted to leak it. It was going to be great. We had a lot of fun, when ya know, coming up with these horrific ideas. You know the thing is that Billy Burke would kill Charlie on drugs. He’d be so good at it. Meghan chimes in helping Stephenie remember all the gory details of ‘Breaking Down.’ Let me just say I am dying to read this hysterical story from Stephenie! The two of them have really talked this story out. It seems to be a running inside joke between the two friends. * Thanks to TwiFans.com for transcribing this portion of the interview! 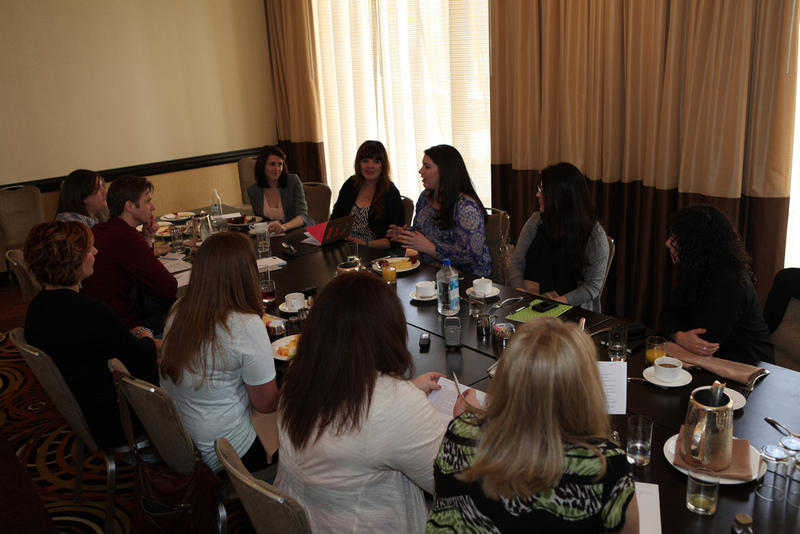 On this Fan Junket Friday we are excited to bring you Stephenie Meyer’s thoughts about the flashbacks in Eclipse! The following is a transcript of the Q&A, but we soon hope to add the audio! TST(Kallie): Ok, I have a question… It is movie related… In Eclipse we get a lot of background for Rosalie, Jasper and the Quileutes. Which I love, love, love! it’s my favorite part of reading the book, and getting to know the characters. So which of the backgrounds are you most excited, or have you been most excited to played out on film? SM: I found Jasper’s really exciting. TST(Kallie): That’s what I’m most excited about! SM: I think that having read them… Well, when I was writing them I really liked the Quileute background. TST(Kallie): I love the Quileutes, and so for me, I was so excited to see the third wife and all that. But because reading Bree (The Short Second Life of Bree Tanner) I am so excited to see Jackson’s background being played out. SM: They’re short in the movie, becasue they have to be. That’s always the heartbreak of them. The biology scene… it kills you because you want to see Rob and Kristen do that. LT: It’ll just be five hours long! SM: Yah! So it was hard to have them shortened down. 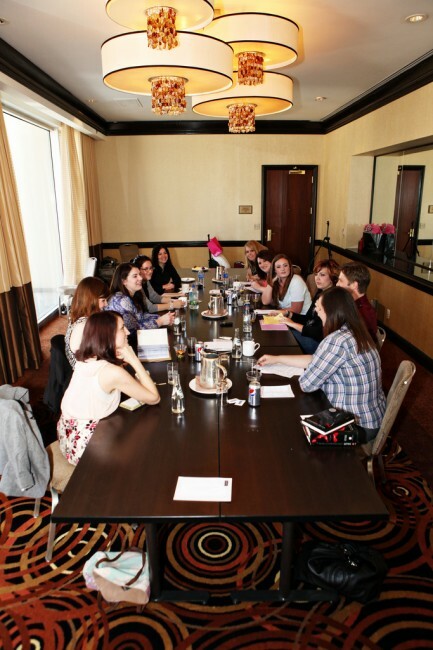 I think that Nikki Reed will surprise you in her section, she does so great! TST(Kassie): I’m excited about that! TS(Matt): She does so great! Everyone: Arguing about spoilers! NO SPOILERS! SM: She looked good! The period piece was really fun! They did have to shorten that down, and there were things I was sad to loose. Again, hope for the DVD extras! I’m always looking forward to those. But Jackson as a human was awesome! Everyone: We want to see it! SM: And, I know there are issues with his hair… right!?! SM: I hear these things! I love his hair in this one. When he is human, and his hair in the practice fight… He had a mohawk for this because he just did Airbender. I always pictured Jasper with a little bit longer hair. I like it when it’s messy. When they try to smooth it, it kind of loses it for me, but I liked this one. It’s a little longer. We were really excited the first time we saw the wig pictures… We were like, “Oh! Nice!” You know, it’s different right? But that happens because they’re all people and, you know, they’re getting older. Vampires don’t do that, but they’re human. 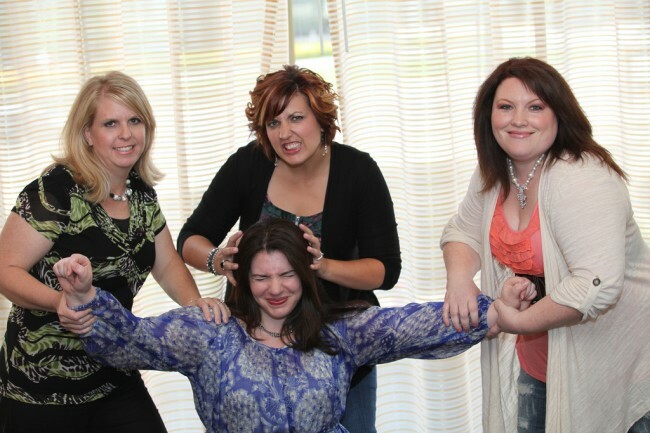 Kallie is ripping Stephenie’s head off (with Twifans help)! We were acting out the final ‘Bree-Beheading’ scene… and there were NO stunt doubles! LOL! Leg hitching, Freak Fred, Edward, Bree and Jane… It’s a lot to cover, and we are only getting started folks! Enjoy this transcription… or click to listen! Stephenie: Okay, so let’s move on! Letters to Twilight: Alright, so we are going to start off a little funny. So, there is this game that people play and you get three names and it is called, “Eff, Kill, Marry”. We are going to do the “Eclipse” version called “Hunt, Leg-Hitch, Imprint”. So, we are going to give you three names and you are going to choose which one. Letters to Twilight: So, lets start out with the Holy Trinity of Edward, Jacob and Bella. Stephenie: No, see I can’t. Stephenie: …because no matter what I say, I am screwed. That’s why, and I love all the kids. They are great. So, I would have to say Imprint for all of them. Stephenie: Isn’t that a cool answer? Letters to Twilight: It is. Letters to Twilight: Well, could we do “Bree Tanner” characters? Diego, Fred and Riley. Letters to Twilight: Oh we don’t care who plays him. Stephenie: You would have to hunt Riley. You see, when he starts out, he is not a bad person when she first finds him. But, she makes him into a really bad person. I guess I would have to leg hitch Diego, and Imprint with Fred because I love Fred. Twilight Series Theories: Yes. That was the biggest response we got from the fans. Stephenie: And, you see Fred was such an accidental character. I love accidental characters. I knew that she was going to have, kind of, a romance there. But, he just came out of the blue. It was so interesting. Although, it killed me when the Spanish publisher put out a little synopsis of the story that was really badly translated and not only did they say that it was Riley who had a talent, but the talent was smell related. And I was like, “Oh my gosh!” I was horrified! I said “No, no that’s wrong”. Then I was worried that people were gonna read about Fred and in their heads think it was a smell thing. And I thought, “No”. Letters to Twilight: No, we didn’t think that at all. Twilight Source: Freaky Fred’s power is that he gives off that repulsion. How do you come up with the powers for vampires? What is in the water in Arizona ? Twilight Source: I really want to know because we were talking about this a lot and we were thinking. Stephenie: Well, anytime you start doing a fantasy, it slowly starts to shift away all the rules. And anyone you read, do you read Jasper Fforde? Go read Jasper Fforde! I am reading “Shades of Grey” right now. His imagination is unreal. But I think that when you take away the boundaries you start thinking that way. Fred is actually not that too far off. He is really related to what Jasper can do. He has an ability to affect how your body feels. And his is very specific. It is kind of like the difference between Jane and Kate. He has one thing he can do, whereas Jasper has the whole range. Twilight Source: I never thought of it that way. Stephenie: It is really related to that classification of talent. Twilight Series Theories: Okay, so that leads into this question perfectly. 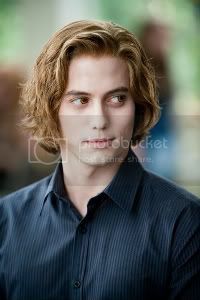 Twilight Series Theories: What is it about his human characteristics or his trait that caused him to have that ability when he is a vampire? Stephenie: I see it as Fred’s backstory. He is in college, a little bit older like Riley and I see him as being – he is beautiful now because that is what happens, but him as being kind of a science nerd. Sort of quiet and sort of not liking other people’s attention. And of course when you live in a room full of newborns, that’s gonna be an even stronger need. So him, having that need to not be seen manifested in that way. And of course that makes him kind of cool. Twilight Series Theories: Well, it is weird because he has got this ability to make people feel so repelled that they are nauseated. I think that is where they got the smell thing from. Stephenie: I think so, but for me it was like completely a feeling in your gut. It wasn’t really a mental thing, more like a visceral and really, really potent. When you have to learn fast when you are in a group like that and so he is in an elevated learning program and he gets good really quickly. And, he is really, really smart. I liked to think about the newborns and what it would be like to be so unable to focus and all the time all you can think about is this driving need that you have and you are barely human. But if you can stop and slow down, you are able to think and you are really bright actually and he is able to do that on his own which makes him unique and special. Twifans: This is one of those questions if you had pictured in your mind or maybe you thought of this beyond your mind but does Edward ever go to find Fred? Stephenie: If I were to go ahead with it, he would definitely come up again. After his character sort of warmed he would fit into a rightly place. I don’t see Edward actively seeking him out. Having the knowledge he had gotten from Bree he realizes that Fred probably wouldn’t appreciate that pretty much, but I do see them crossing paths. I was really relieved in a way, I didn’t see anybody surviving. And so as Fred started developing it was really a relief to let someone survive and for someone you care about. Twilight Series Theories: I just loved the introduction to the book that you did say “I was writing this and I did have a hard time that I made this decision before…” That helped me through. Stephenie: By the end, you know, when I first started out I didn’t even think about it, I was thinking “this will be cool” it was all about the mechanics of it. And then when you start like “I have to kill her”. On set it was crazy because Jodelle is teeny. She is this little – actually she looked a little younger even though she is fifteen. My Bree in the book was grown up looking because she had a hard life but Jodelle did a really good job. They cut a scene of hers where I really think she captured her. I hope it makes it on the DVD. But, then you have Daniel Cudmore, who is – you can’t even tell in the movies but he is a monster! Stephenie: The first time I met him, he was in the full Volturi garb with his eyes. It was impressive. So he was coming over to rip up the little girl and the difference between them was really – it made me sad. And you watch it all day because you shoot the scene in fourteen different ways all day long so they keep killing her over and over again. Twilight Source: You know, I was saying this to Matt before and I feel like the fact that Bree’s life, how tragic it is in the fact that she dies, is a really juxtaposition to the series that we see from Bella’s perspective. Because, you always hear Edward saying, “This is a really tough life and this is not something that you want to be”. Stephenie: And no one ever believes him. Twilight Source: Exactly! Because you see it from Bella’s perspective of the Cullens are beautiful. But, Bree shows that he is right in a lot of ways. It was obviously tragic to see her die, I fell in love with her too. But you see that Edward’s perspective is vindicated in a lot of ways. Stephenie: And you get to see Jasper as he hadn’t been, as good at what he does. Stephenie: When you are created for a reason that has nothing to do with your well being and serving someone else’s purpose and how used they are, they have no idea and are doomed from the start, it is just really sad. Twilight Source: Which is why I just love the scene where Jasper and Bree, towards the end, where it is really intense because obviously it is coming full circle for Jasper in a lot of ways. Stephenie: It was more focused on Edward and her connection. Which when I was writing it the first time it was all Bella and you are in that mode and you are so oblivious to a lot of things but when the line was really – it was really cool – I was writing it through and I had realized “hey Edward is gonna know everything she is thinking” so how are we going to do this? And his line was starting to play in to everything. That final line, I was getting chills. Twilight Series Theories: I was too! Twilight Source: Who was he talking to!? Stephenie: He was talking to both of them. When I wrote it for Bella it was absolutely him talking to her, but then when I wrote this one, I thought “he was talking to Bree. Oh my gosh”, and when he was trying to save her I could feel his – so much more than when it was just “don’t do this horrible thing”, but then he was really trying to save her specifically and knew what a good person she was and I was just like “Aw”. And he couldn’t do anything. Stupid Jane! Twilight Series Theories: Stupid Jane! 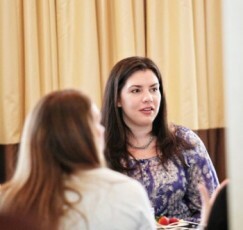 This week we are very excited to bring you another chunk from our interview with Stephenie Meyer! We are bringing you some juicy details about The Second Short Life of Bree Tanner, and how it ties to The Twilight Saga. So enjoy! Q: So we really want to know, I mean this is like kind of 2 part and it’s totally unrelated but also related, where in the world Fred and Diego’s names came from? Were they old boyfriends, was it a gardener?
? : I pictured him as like really big. Kind of overweight guy. SM: No. He should be, in his vampire form, quite good-looking.
? : Yeah, I literally just [pictured him] like a big guy who took up a couch.
? : Right, maybe that’s why. That’s funny how that worked. Elysa from Twilight Source: Bree and Diego. They seem, I dunno, they seem very tame in a lot of ways obviously in comparison to the rest of their group. How was it that they were capable of, I mean, human emotions in a lot of ways: compassion for each other, love for each other? And they were newborns, so that was really interesting to see. SM: I had three brothers too and it was funny that they were super sweet and then there’d be those moments where they get so angry. I remember the oldest of my younger brothers was unloading the dishwasher and someone said something to tick him off, and he took a cup in his hand was just like (Grrrr…) and punching holes in walls! And I was like: “Wow!” Matt’s like: “I never did that!” You were a nice teenager and your mother loves you. SM: She [Bree] kind of had to stay away from that energy also. And then Diego’s been around for awhile. He’s starting to reach the cool-off period. Like things are starting to not make sense to him, and Riley can’t distract him as easily because these questions are unanswered. And when you stop and look at them they’re really big questions but they just never do. And you can also train newborns, which you know Victoria’s picked up, so that they have automatic responses. She’s done that with the daylight, and made it so ‘Fire! Fire! Fire!’ that they can’t…they don’t think about it. He’s done that with the routine all along so that they have a certain thing that’s easiest for them to follow and Diego’s got to the point where [he questions]: “Why am I doing this?” And he sort of pulls Bree out of it too because she doesn’t think about it very long but when she’s talking to him then she starts realizing: “Wait a minute…What is this?” They just don’t think about it till then. Elysa: Bree Tanner made me realize actually just how pertinent the term ‘newborn’ actually is because I felt like you see so much how environment really shapes their behavior. Elysa: I think in a lot of ways, at least toward the beginning of the series, you kind of assume that when you’re a newborn there’s absolutely no choice. You’re going to turn out a certain way no matter what. But we see with Bella and then with Bree a little bit, like you were just saying, that environment can make all the difference in the world. Kallie: I love how you explained it in the book, too; how they smelled it [blood] or they saw their prey and they changed. Like they were crouching, and they were ready to pounce. You know, like it wasn’t even that they had a choice…it just was like a reaction. SM: Very animalistic. You know and when someone tells you, “Okay, you’re special now and this is what you do, and this is who you hunt and don’t think about it.” You don’t think about it. SM: Poor Jasper, he’s not very good at the diet. Which we can all understand right? Kassie (? ): Alright, we wanna know kind of the timeline for when you created Diego, or when Diego, Riley and Fred were created as vampires. SM: Um, you know Riley showed up in Eclipse. You know he was one of those characters that starts out as a tool without having much person to him, but then as you write about him. But then it was hard not being able to see much of him. That final scene with Edward, I felt much more pity for him than I did when I was writing Bree because here you have this guy who comes into it and he’s been lied to and manipulated more than anyone else. I mean the newborns have been manipulated, but not the way he’s been. And he’s been lied to more than anyone and Victoria is his whole life, and to have her dismiss him the way that she does. He has that moment where he could survive if he listened to Edward. And when Edward says, “I don’t want to kill you. You can walk away from this”, and he doesn’t. He makes the wrong choice which is hard. So he evolved then. Bree was just an example of a newborn when I was working with her in Eclipse, and then when I started with [?] being like,…Well actually it was Rebecca then. Rebecca saying, “What was going on?” I had to re-tailor the story to have more clues about what’s happening and she really wanted to know: “Tell me what happens in Seattle.” And so then I was looking at it, and that’s when you start getting the stories. Once the stories start you kind of have to write them down. So Diego formed really quickly. Originally the opening scenes started out with the Spider-Man theme song because it was just him skittering on the walls and sort of this crazy bizarre thing. And I knew she [Bree] needed someone to talk to and she needed somebody sane. So Diego showed up really quickly as somebody who’s outside of the newborn madness already and sort of already past that. Fred was a little bit later where I was thinking you know here you have this little girl who’s been thrown into this setup. How does she survive? And she wasn’t talented, but you know I figured if there was somebody else who was. It all kind of came together really easily and organically. Kallie: Was Riley created while James was still alive? SM: No, very quickly after his death. SM: Victoria, you never see it from her perspective but some of the things about her character is she is so non-confrentational. She doesn’t take people on face-to-face because that’s not…she’s a survivor. SM: Yeah, she’s the behind the scenes manipulator. You know James was always kind of the front guy, right? She let him lead the way, and she let him you know…And she was crazy about James but she let him take the danger for her ‘cause that’s who she is! Um, and so she felt very alone. You know, she’s lost this guy. Laurent’s run off and kind of gone off with the enemy as far as she knows and she picked Riley, he was big and strong and she felt like: “I need someone to stand in between me and everyone else.” And then you know she starts coming with ways to use him, and so he was really early in. You know, I love what Bryce has done with her. I love Rachelle and she had a great, strong, feral kind of Victoria. Um, but and I don’t know if this will be out there when the companion comes out: Bryce was the first choice. SM: And she was pregnant and the whole bit, and so we always loved her and she comes in and makes Victoria the manipulator again. The ‘Victoria’ now isn’t the one who’s gonna stand up there like she’s ready for a fight. She’s the one who’s gonna be like: “You go fight them and I’ll be the one left standing.” And she does the voice, like the really sweet voice! Agh! She kills. She kills. And when you watch her do the manipulation thing and you see how it would work. SM: Her face is insane, oh my gosh! Every time I watch it with the eyes, you’re like: “How does a human face do that? !” She’s gorgeous, and so nice like really, really fun. When she came in it was hard for her because you know everybody was freaking out over Rachelle and she was so sweet about it. When the whole mess went down with the scheduling she said, “Look, I’m not gonna do this unless… You know, I’m not cutting in on anybody.” She was really great about it. Very lovely. Thanks go to *STEPHANIE* for transcribing this week! You are AWESOME! *Thanks go to Twilight Source for transcribing this week! *Thanks to Twifans, and Sam for getting the audio approved! *Thanks to Letters to Twilight for the fun new game! what would be the next after breaking dawn? Log in | 51 queries. 1.082 seconds.